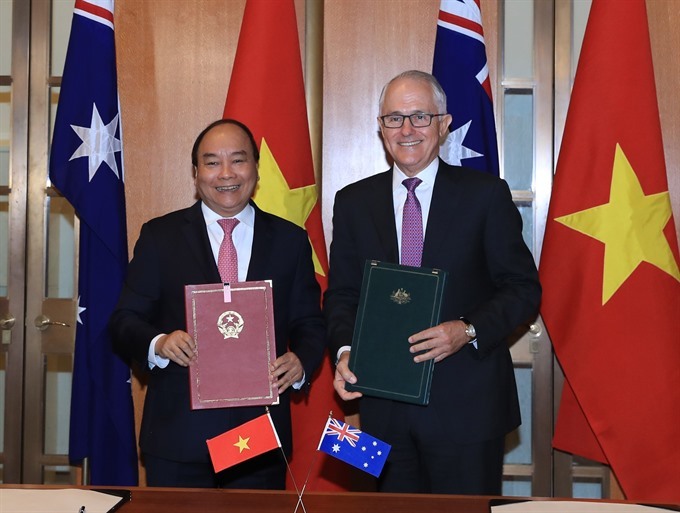 Viet Nam NewsCANBERRA — Prime Minister Nguyễn Xuân Phúc and his Australian counterpart Malcolm Turnbull signed a joint statement on the establishment of the Việt Nam-Australia Strategic Partnership following talks in Canberra, Australia on March 15 as part of the Vietnamese PM’s visit. At the talks, PM Turnbull expressed his pleasure to host the Vietnamese Government leader following their previous meeting at the APEC Economic Leaders’ Meeting in Đà Nẵng, Việt Nam in November 2017, and at a time when the two sides are celebrating the 45th anniversary of their diplomatic relations. He said he is impressed by the Vietnamese Government’s efforts in socio-economic development and international integration, especially the country’s successful hosting of APEC Year 2017. PM Phúc congratulated Australia on its achievements over the past year, especially in economy, noting his belief that Australia will continue growing in a sustainable and prosperous manner, with greater role and position in the region and the world. The two sides shared delight at the progress of the Việt Nam-Australia partnership over the past 45 years, with strengthened political trust and strategic interest sharing, which has paved the way to lift bilateral ties to a strategic partnership. They agreed to increase the exchange of high-level delegations through all channels of party, state, government and parliament as well as people-to-people contacts. To realise the bilateral strategic partnership, the two sides concurred to set up contact mechanisms at the level of foreign, defence and economic ministers, while maintaining existing bilateral co-operation mechanisms such as the diplomatic and defence strategic dialogues, consular consultations and dialogues on agriculture, education and science-technology. They will continue to implement the Việt Nam-Australia Plan of Action in 2016-19, and creating optimal conditions for localities of both sides to promote their partnership. The two PMs lauded the effective affiliation in defence and security, which shows high political trust, through activities of capacity building, English training, joint drills, information sharing and co-operation among military forces, especially naval forces, as well as visits of Australian Royal Navy’s ships to Việt Nam. PM Turnbull affirmed that Australia will expand training assistance and support Việt Nam in UN peacekeeping operations, initially by providing equipment and logistics services to the Vietnamese mission in South Sudan. Both sides agreed to enhance co-operation in coping with common security challenges, including terrorism, transnational crimes, human trafficking and illegal migration, thus ensuring security in each country and contributing to peace and stability in the region. The PMs expressed pleasure at the growth of two-way trade in recent years with nearly US$6.5 billion in 2017, up 7 per cent over the previous year. Australia is the eighth largest trade partner of Việt Nam, while Việt Nam is the 15th largest trade partner of Australia. Both sides agreed to create top conditions for the development of bilateral economic ties, increasing economic interests in bilateral relations based on the complementary nature of the two economies. PM Turnbull affirmed that Australia welcomes Việt Nam’s tropical fruits and fresh agricultural products gaining access to its market, and encourages close co-operation between the two countries’ offices, associations and businesses in increasing product quality and hastening import procedures, first of all for Việt Nam’s fresh shrimp and dragon fruits, and later for other fruits such as longan, rambutan and star apples. Both host and guest stressed the need to expand investment in each other’s strong fields. PM Phúc asked Australia to encourage its businesses to invest in Việt Nam in energy, infrastructure, telecommunications, knowledge-based economy and science and technology. Phúc spoke highly of Australia’s official development assistance (ODA) for Việt Nam, notably the Cao Lãnh bridge project which will be inaugurated this year. He asked Australia to continue providing ODA, focusing on infrastructure, agriculture, rural development, climate change, high-quality human resources development and e-government building. The two sides emphasised closer connectivity between the two peoples through education co-operation, cultural exchanges and tourism development, serving as a foundation for the bilateral strategic partnership. They underlined the importance of education collaboration, with Australia pledging to increase the number of scholarships and support Việt Nam in training. They also agreed to boost ties between their universities and training establishments. The PMs expressed delight at the increasing number of Vietnamese students in Australia. Currently, there are nearly 30,000 Vietnamese students in Australia, who have contributed to improving the quality of human resources and Việt Nam’s socio-economic development, together with 60,000 alumni. The Australian leader said he is impressed by bilateral tourism growth, with nearly 500,000 Australians visiting Việt Nam in 2017. He appreciated Việt Nam’s facilitation of visa granting for Australian citizens. The two sides agreed to encourage the opening of more direct air routes between the two countries’ major cities, and encourage participation in the Việt Nam-Australia Work and Holiday programme. Australia pledges to maintain assistance for Việt Nam in high-tech and organic agriculture, and support the implementation of the Việt Nam-Australia Renovation Partnership Programme, PM Turnbull said. PM Phúc took this occasion to ask the Australian government to continue creating favourable conditions for the Vietnamese community in Australia. The two government leaders also exchanged views on regional and international issues. PM Phúc appreciated Australia’s support for Việt Nam’s hosting of APEC Year 2017, and congratulated Australia on hosting the ASEAN-Australia Summit. PM Turnbull reaffirmed that Australia supports the central role and unity of ASEAN. He hailed PM Phúc’s visit and the upgrade of bilateral ties to a strategic partnership ahead of the ASEAN-Australia Summit as a significant contribution to the Summit and ASEAN-Australia relations. The two sides agreed to continue with their co-ordination at regional and international forums, including the Association of Southeast Asian Nations (ASEAN), the East Asia Summit (EAS) and the Asia-Pacific Economic Cooperation (APEC) forum. PM Turnbull appreciated Việt Nam’s role in pushing the signing of the Comprehensive and Progressive Agreement for Trans-Pacific Partnership (CPTPP) in Chile. He urged the two sides to co-ordinate with each other in the ratification and implementation of the pact, expressing his belief that the agreement would benefit its member countries while keeping the door open for the US and other nations that want to join the deal in the future. Host and guest also agreed on the significance of ensuring peace, stability, security, and safety, freedom of navigation and overflight in the East Sea, and settling disputes on the basis of international law, including the 1982 UN Convention on the Law of the Sea. They also showed their support for the early conclusion of a legally-binding Code of Conduct in the East Sea. PM Phúc took the occasion to invite his Australian counterpart to soon visit Việt Nam. The Australian leader accepted the invitation. Following the talks, the two PMs signed the Joint Statement on the Establishment of a Strategic Partnership between Việt Nam and Australia. They also witnessed the signing of four important documents, including an agreement between the Vietnamese Ministry of Education and Training and the Australian Department of Education and Training on educational co-operation between the two Governments for 2018-2023. The other three comprise a memorandum of understanding (MoU) between the Vietnamese Ministry of Labour, Invalids and Social Affairs and the Australian Department of Education and Training on vocational education, an MoU between the Vietnamese Ministry of Science and Technology and the Commonwealth Scientific and Industrial Research Organisation on enhancing collaboration in science and technology and an MoU between the Vietnamese Ministry of Science and Technology and the Australian Centre for International Agricultural Research in the spheres of agriculture, forestry and fisheries. PM Phúc stressed that the establishment of the strategic partnership has created a historical milestone in the bilateral ties, helping deepen the two countries’ co-operation, both bilaterally and multilaterally. Meanwhile, PM Turnbull affirmed that Việt Nam and Australia will stand side by side in development, within the framework of the strategic partnership, as well as co-operation mechanisms of ASEAN or CPTPP, for the sake of the two countries’ people, and for security and prosperity in the region. On this occasion, PM Turnbull hosted a banquet for his Vietnamese counterpart and his entourage.